Built for the World's Fair (Exposition Universelle) of 1900, the Petit Palais today is a Paris city museum devoted to the fine arts. 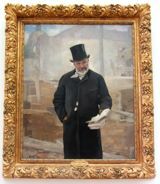 Above, Portrait of Adolphe Alphand, Public Works Director, International Exposition of 1889. The Petit Palais, right across Avenue Winston Churchill from the Grand Palais (map), is a charming building that houses a lovely fine arts collection. Known also as the Musée des Beaux-Arts de la Ville de Paris, the museum is one of the fourteen museums of the City of Paris, and admission to the permanent collection is free. The collection ranges from Greek and Roman antiquities to art from the early 1900s, when the building was constructed. Much of the collection was a legacy to the city from collector Auguste Dutuit and his brother Eugène. 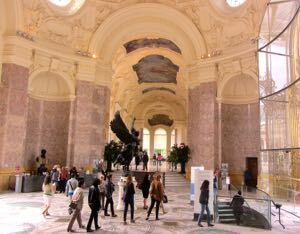 The Petit Palais houses one of France's largest collections of Dutch paintings, after that of the Louvre. It is also home to a large collection of religious paintings and icons ranging from the 14th century to the 20th century. The Renaissance collection includes paintings, furniture, works of art, books, and other objects from the 15th to the 17th century. It covers France and Northern Europe, as well as Italy and the Islamic world. The works from 1900 emphasize sculpture, which was very popular at the time, as well as Impressionism, symbolism, and art nouveau. The Petit Palais forms part of a monumental architectural trio, along with the Grand Palais (just across the street, today hosting special exhibitions) and the Pont Alexandre III, an ornate, gilded bridge that traverses the Seine and leads to Les Invalides. Graceful and beautiful facade of the Petit Palais, just across the street from the Grand Palais. 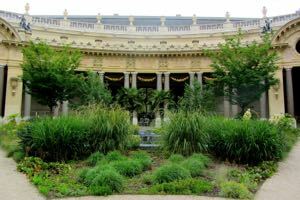 The Petit Palais also has a lovely interior garden and a small restaurant. There is indoor dining, and in nice weather the terrace is a delightful place to have lunch or to take a break from your visit. Although it's known as the small palace, it's actually quite big, with lots to see. It also offers a variety of special exhibitions throughout the year. It also has a small concert hall where you might be able to catch a recital or performance by a young artist. Closed on Mondays; free admission. Open some evenings (temporary exhibitions only). Below, it's hardly petit inside!